Karthi’s Theeran Adhigaram Ondru, directed by H Vinoth, is one of the finest realistic cop stories in recent times. It is a well made movie based on a sensational and gruesome crime committed by organised roaming gangs that do not leave evidence, and in police records some of them remain unsolved. A super-cop film has always been a favourite for larger-than-life Tamil stars. All top stars have an affinity to don the khakee and have done this role umpteen times in commercial movies. Karthi too has done a commercial cop character in his super hit film Siruthai. However, there is an ocean difference between the two films, as the script of Theeran Adhigaram Ondru is based on real life, raw scenes brimming with drama. Karthi holds the film together as a gritty and dedicated police officer who takes on the dacoit gang. 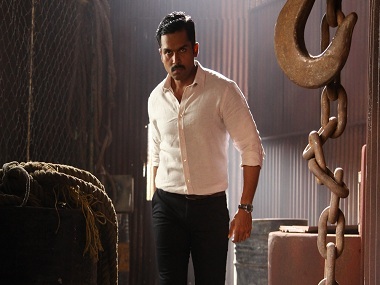 Karthi in Theeran Adhigaram Ondru. The story starts right as the credits roll. An organised gang of hooded dacoits loot and murder residents of highway farm houses in Tamil Nadu. The gang leaves no clues behind, and the police go around in circles and at times close the case. Enter Theeran Thirumaran (Karthi) — a young and idealistic cop — after a local MLA’s farm house is ravaged by the dacoits. Theeran painstakingly starts investigating the case and finds out that it is the handiwork of a criminal gang operating in Northern India. What makes Theeran Adhiragam Ondru crackling is that it is not your regular formulaic cop story. In fact our hero takes a lot of time and uses his brain more than his brawn to finally nail the culprits. But at the end it is only a Pyrrhic victory as he loses everything in life to nab the deadly gang. It is an honest film, well researched and documented, that is able to strike a chord with the audiences. The film is very different in tone and presentation. The makers authentically portray the functioning of police and how they investigate. They have also shown us the practical difficulties in arresting criminals who operate outside the state without much commercial glorification or melodrama. The only commercial compromise Vinoth has made is to have a romantic plot for the hero for the regular family moments, comedy and background songs. In fact Rakul Preet Singh as Priya is a sweet, traditional and homely Tamizh ponnu — the romantic interest of the Theeran. Karthi and Rakul have good chemistry in the lighter moments in the film. But beyond a point the romance and her character gets irritating, and slows down the pace in the second half. Meanwhile, the villains look raw and real and Abhimanyu Singh as the deadly dacoit is terrific. Bose Venkat as Karthi’s assistant has a meaty role. Dhilip Subburayan’s action scenes especially in the desserts of Rajasthan are superbly choreographed and Sathyan Sooryan’s camera work is in sync with the story including the grey tone. Ghibran’s music and background score creates the gritty feel but at times a bit too loud. On the downside, the film is too long at 2 hours and 37 minutes and needs some trimming. Nonetheless, kudos to director Vinoth and Karthi for taking the road less travelled in a commercial cop story. Theeran Adhiragam Ondru is an engaging watch.